The fifth edition of the Premier League in 2009 was a tumultuous one. Besides Phil Taylor, Raymond van Barneveld, Terry Jenkins, James Wade, John Part, Mervyn King and Wayne Mardle, Jelle Klaasen gets a wildcard from the organization after he had played a good World Championship. There are many players who are above him in the world rankings that certainly disagree with this choice. However, that is not the most talked about subject that year because that honour goes to Wayne Mardle. Hawaii 501 comments after his matches in week eight and nine he is not feeling well. In week ten he is not able to play. The schedule is adjusted so that Mardle’s absence is covered. But Mardle is still not fit enough to play in week eleven. As it turns out he has the mumps and he certainly cannot play in week twelve either. All results against Mardle are taken out of the competition. Instead of Mardle in the remaining weeks, an exhibition match between the intended opponent of Mardle and a special guest is organised. This gives chances to players like Robert Thornton in Scotland and also Adrian Lewis, Mark Webster and Gary Anderson to show themselves. In the end Taylor finishes first again. James Wade, Raymond van Barneveld and Mervyn King accompany him in the semi-finals. Jelle Klaasen will win only one match in 2009 against Terry Jenkins. In the semi-finals, Raymond van Barneveld loses like a year earlier to James Wade. Much more surprising is the defeat of Phil Taylor against Mervyn King. King used his chances and wins 10-6. 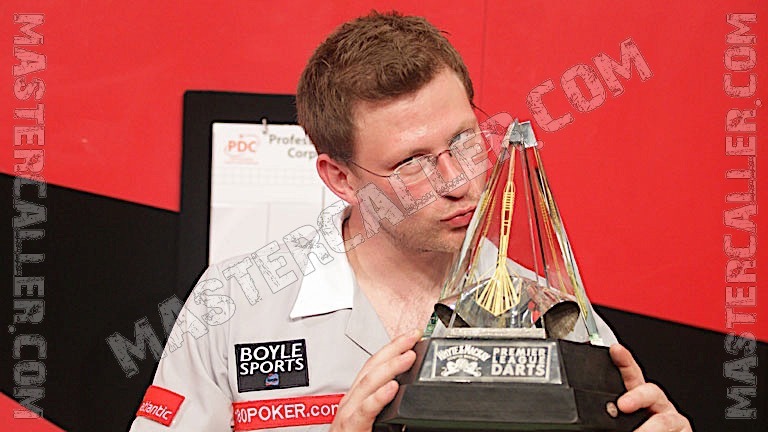 In the final James Wade proves stronger than Mervyn King. The Machine is the first player whose name appears on the trophy alongside Taylor.